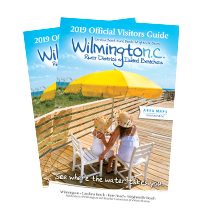 The Wilmington International Airport (ILM) is the perfect-sized airport and huge on hospitality and convenience. As the fourth largest airport in North Carolina, Southern hospitality greets visitors with a putting green and rocking chairs bidding welcome to the gateway to southeastern North Carolina. Everything from baggage claim to parking is easy. Fly ILM to get your coastal vacation off to a quick start upon arrival! ILM welcomed two new non-stop routes to Chicago O&apos;Hare (ORD) and Dulles/Washington DC area (IAD) on United Airlines. American Airlines also expanded its service with a daily non-stop flight to Reagan National (DCA). American also added daily service to Dallas Fort Worth (DFW). ILM serves southeastern North Carolina with major commercial and general aviation services. For more information, call 910-341- 4125 or visit FlyILM.